Fall arrived too soon and too abruptly – for me… One will never be content. Despite the heat, we enjoyed some fun activities and the wonderful folks who rented our guest apartment at Les Rosiers. The season kicked off with the arrival of Klaus from Austria, his car loaded with Austrian delicacies and beer. He always brings us a generous gift of goodies, too. 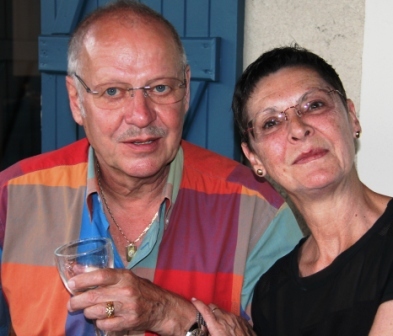 This was the fifth season that Klaus and his wife Eva have spent a month in our rental studio. 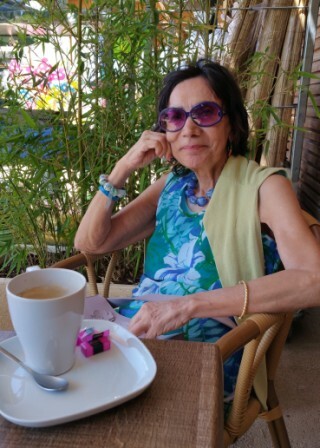 She is still working as a legal secretary in Graz, arrives a week later by plane and only spends two weeks here. 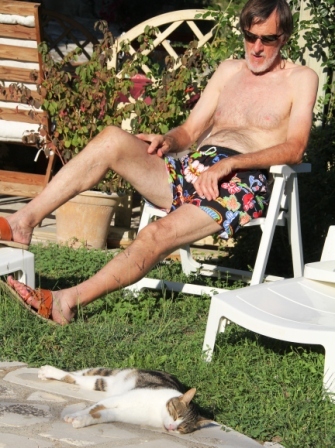 Klaus likes to cook and grill – lamb is his favorite. They know the area well, take long walks, swim, and visit friends and flea markets. They have become friends, and it’s always a delight to have them here. 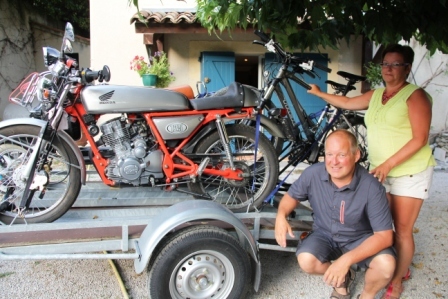 Then came the Belgians, Patrick and Chantal, with two motorcycles and two bicycles towed behind their car. We were amazed. Due to the heat, they spent most of their time on the motorcycles. One of the bicycles was electric, but since the terrain here is anything but flat, they preferred their motorcycles. They took long excursions, almost every day during their two-week sojourn. Chantal said they have been vacationing in southern France every summer, but always camping. They especially enjoyed the tranquility at Les Rosiers. Camp sites can be very noisy, she said. And, they loved our town, Reillanne. 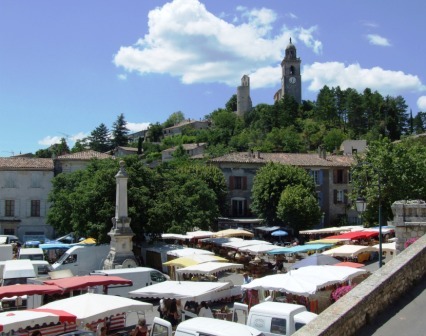 “It’s an authentic village, not a Disney village like so many in the Luberon,” said Patrick. “There are not that many tourists, not that much traffic.” They like to visit the village cafes and talk to the locals. And, they especially liked the Bar restaurant de la Place where they dined many times. 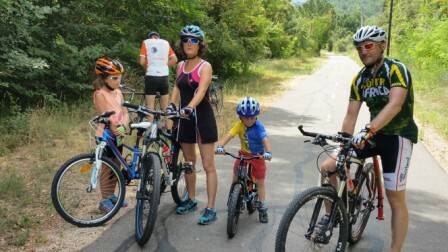 More bicycles next – a Czech family of four with five bikes. Jakub and Katarina and children Lara, 9, and Luka, 5, were back for the second time. 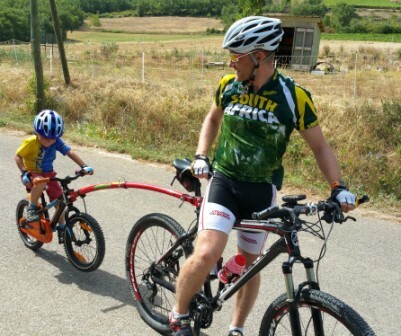 We were overwhelmed with their bicycle prowess two years ago when they set out day after day, all day on bikes, albeit Katarina towing Luka in a carriage and Lara’s bike sometimes attached to her father’s bike. Lara now rides on her own, and Luka rides the bike that can be attached to Jakub’s . We rode with them one day – lots of fun. They arrived a day late after participating in an orientation competition in the Jura where Jakub took first place in one category. Here he conquered Mont Ventoux for the fifth time. That was the reason for five bikes – a super bike for the challenging climb. 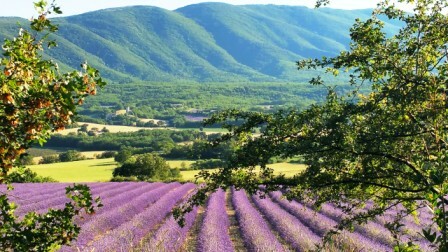 “We always like to come back to Provence, the terrain, the living historic villages that are not just for tourists,” said Jakub. We were happy to have them back. 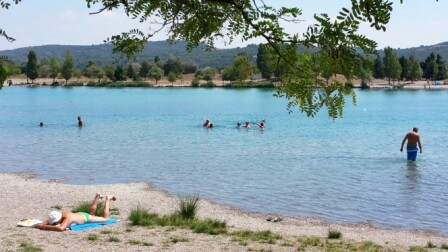 The hardy cyclists enjoyed the pool after those rides in the blazing Provence sun. 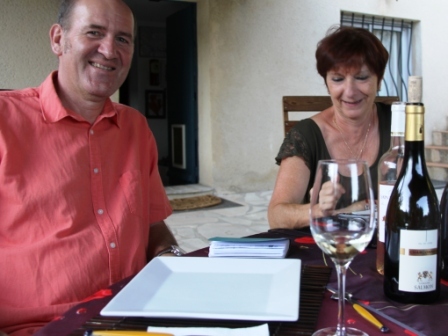 Wine was the focus for Patricia and Serge, visitors who come from Brittany. 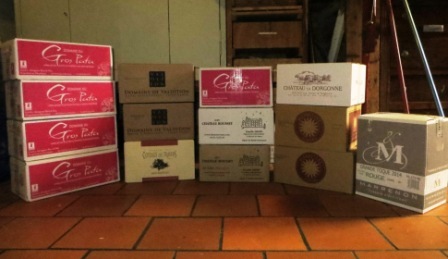 They traveled far and wide to buy Provence wine, driving 1,700 kilometers in the region, visiting six wineries and ending up with 14 cases of wine to take home. Each evening when they returned from a buying trek they shared their adventures and raved about places they visited – some we had not known about. Serge says they always buy the wine of the regions they visit. They live in an area of vineyards near the Loire where he helps harvest the grapes. They presented us with a bottle of Grand Reserve Muscadet Sevre et Maine sur Lie which we tasted when they invited us to a super fish dinner Patricia prepared. She served the fish with beurre blanc, a well known sauce for fish in Brittany. She shared her recipe which I have tried to master. Mine could not hold a candle to hers, but I will keep trying. When I am successful, we will open the precious bottle of Muscadet. Niki came to visit from Athens. 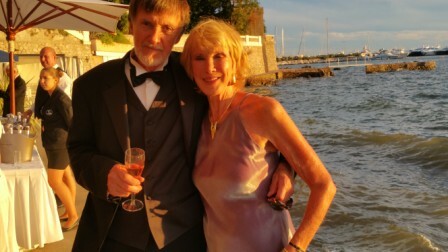 We met on a student ship 50 years ago!. 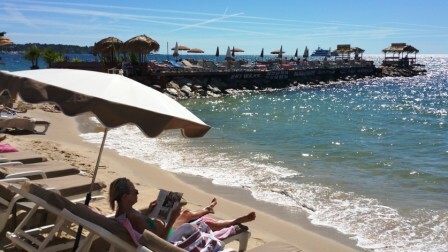 We visited the US this summer (see previous post, “USA: Summer 2015,” July14) and the Mediterranean coast (previous post: “Cannes: Far from the Madding crowd,” Aug. 20). We recently went back to the coast for a gala evening at the Hotel Belles Rives in Juan les Pins/Antibes. Our Finnish friends, Terttu and Mikko, have a rental apartment which they generously offered us. In addition to dining and dancing, I swam in the Med which sure beats a pool, and we took a short but scenic hike around Cap d’Antibes. We are not sorry the heat has subsided, but sorry that summer is over. The days are getting too short. Some restaurants will soon close for the season. No more concerts and village festivals. Winter can be bleak here, and it’s a long wait for spring. Photos of other summer activities follow. BB/VR* and Filippo chill out poolside. 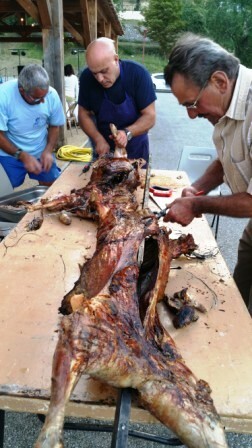 A Bastille Day Mechoui– lamb grilled on an open fire. The lavender must like the heat. The color was especially vibrant this summer. Yes, we are lucky. This is a lovely part of the world. And, your dogs are more than lovely. Thanks for the comment. Yes, we are lucky. This is a lovely part of the world. And, your dogs are more than lovely. Thank you for your comment. Really enjoyed your summer recap. It’s always lovely looking back on “les beaux jours” and a good reminder to take stock from time to time of how lucky we were. Of course I love seeing my dogs on your blog-you’re making them world famous 🙂 ! 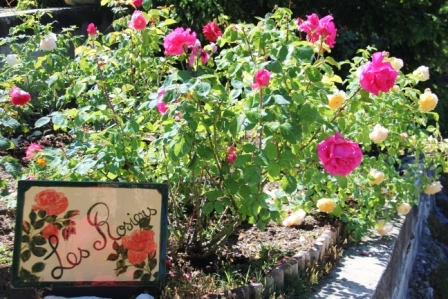 I loved reading about your summer guests at Les Rosier and remembering how wonderful it has been spending time at your welcoming home. 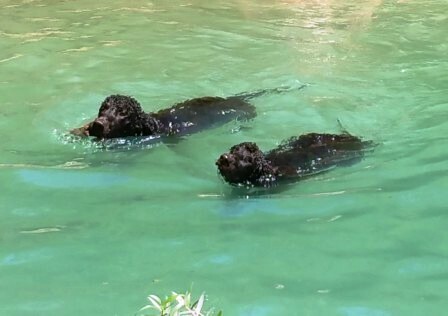 Also enjoyed the photos —-and especially seeing Lynne’s Irish water spaniels. Wish I could have been there with you and VR to drink the pink! 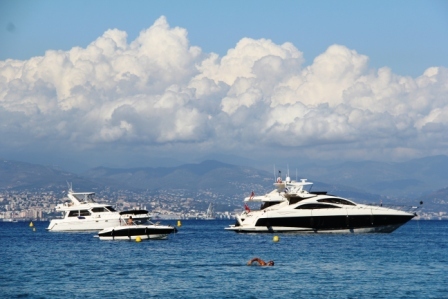 And you look gorgeous in the Antibes shot! Miss you, Gloria in So. Calif.
It’s always a treat to hear from you, Gloria. I am glad you enjoyed this post. Drink some Ca. red for us. Pink season is ending too soon. Many thanks Sandra. 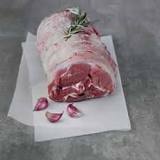 I am thrilled to know you like the recipes, too. Super busy summer for you guys. What a fab photo of you two by the Med–a keeper! It’s been fun. We like that photo, too.